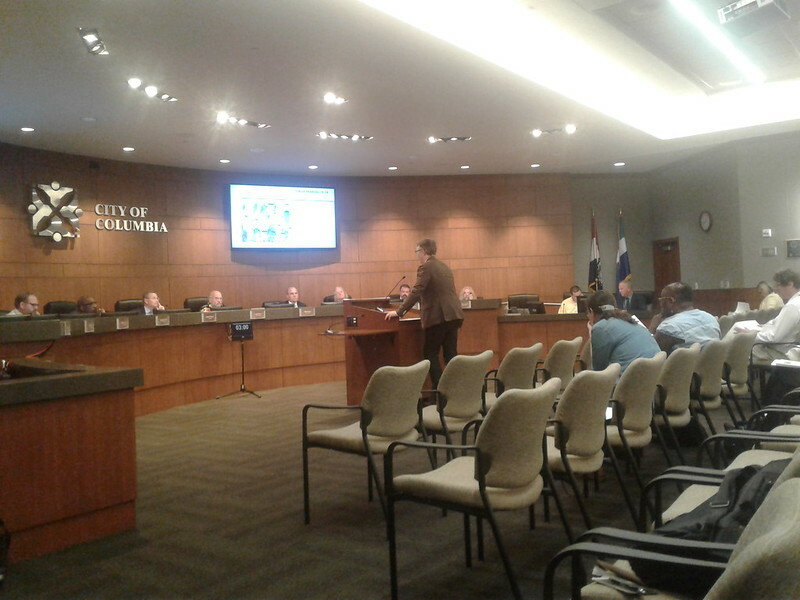 Jeremy Root addresses Council last nightA "toxic political environment"
COLUMBIA, Mo 8/7/18 (Beat Byte) -- Columbia City Council members last night soundly defeated city manager Mike Matthes' no-vote property tax increase five to two. A chorus of voices condemned Matthes' tactics and criticized his money-handling skills. News also broke that Finance Director Michele Nix resigned and that Matthes had left the positions of city auditor and treasurer vacant for years. Several references to the large cash reserves and savings accounts emerged, calling into question low city salaries and the need for higher taxes. Retired Water and Light Department administrator Jim Windsor was particularly harsh, reciting a litany of poor policies and practices that reflect Matthes' "mediocre management". Columbia Mayor Brian Treece led the charge against the Sneak-a-Tax, which would have raised property tax rates by two cents per hundred dollars of assessed value without a vote of the public. Matthes literally "snuck" the tax onto the Council's automatically-approved Consent Agenda last month, to pay for a new southwest fire station in the Fifth Ward. Council members removed it from the Consent Agenda on discovering the ploy. After hearing fire chief Randy White's presentation in support of the tax, Treece acknowledged the chief's points, but said hiking the tax without a vote wouldn't be right. During his pitch, White contradicted himself enough times that eyes were rolling in the audience and on the Council dais. He seemed to suggest taxpayers erect the fire station with no one to staff it, an idea that struck several observers as absurd. Complaining that his department was already "stretched too thin," White said the new station would stretch it even farther, but he "hoped budgets would catch up" so he could adequately staff it. White also contradicted Boone County Fire Board member Bill Watkins' earlier comments about the city's relationship with the Boone County Fire Protection District. Visibly angry at Matthes for blowing off meetings and other communications, Watkins -- Matthes' predecessor -- told a League of Women Voters forum cooperation between city and county could relieve both departments' staffing and fire response issues. He reiterated those comments in the Columbia Missourian. White, however, said Boone County's "all volunteer" firefighters simply weren't up to the task, citing training differences that could hinder their involvement in city fire and emergency calls. When Treece asked what "immediate benefit" taxpayers would receive from the tax hike, Matthes revealed the fire station wouldn't rise any time soon. He planned to "save up" the $3 million building cost over six years. The property tax hike would only generate $470,000 annually. "That's the most conservative route," Matthes explained. "But you could take out a loan and pay it back with the tax proceeds." An email poll he sent to Fourth Ward constituents convinced Councilman Ian Thomas to vote no. "Fifty percent of respondents represented the 'backlash' to this tax I believe could defeat future tax hikes," Thomas said, reflecting a widespread worry. "They don't like it." Council members hope to ask the public -- again -- for a new property tax to fund more police, despite the city's $325 million 'pooled cash' savings account at Union Bank of Switzerland and individual department reserve funds that exceed national standards, some by more than double. Decrying a "toxic political environment," Third Ward Councilman Karl Skala was true to his word this time, voting against the tax. First Ward Councilman Clyde Ruffin and Sixth Ward Councilwoman Betsy Peters joined the no-voting majority. Second Ward Councilman Mike Trapp and Fifth Ward Councilman Matt Pitzer voted yes. Pitzer insisted his Ward needed the fire station.